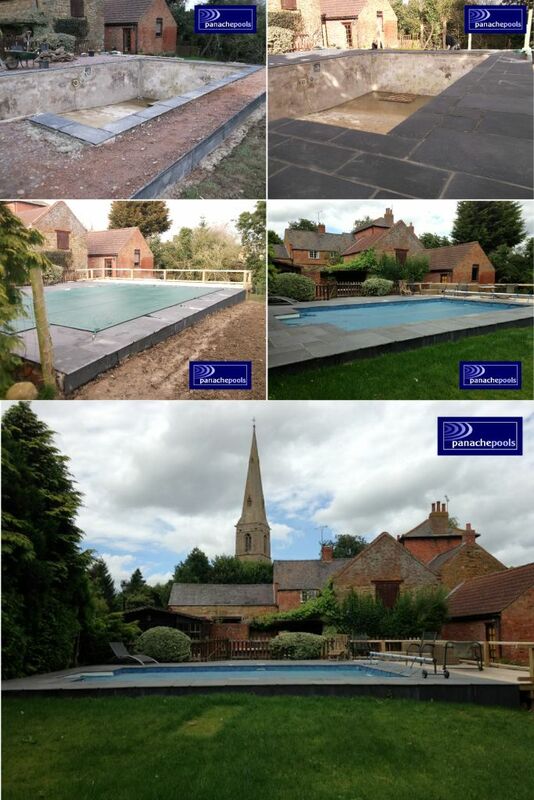 If you own a swimming pool that has seen better days a refurbishment can restore it back to its former glory. Of course, the extent of the refurbishment depends on your pools present condition, but something as simple as replacing a liner can have a dramatic effect. You can see in the pictures a couple of local refurbishment projects we have undertaken recently. 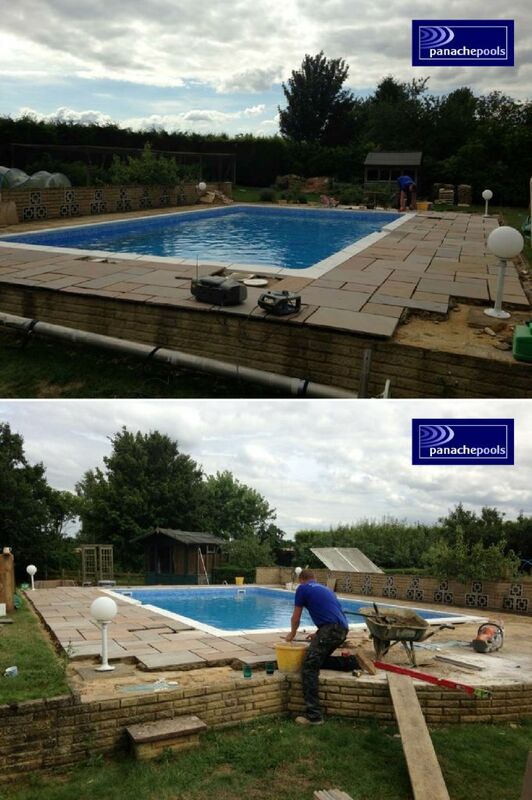 This project required a new 30 thou quality liner, new copings and pool surround. We fitted white, hand-made, tapered bull-nose copings and laid natural stone, random paving to the pool surround. The paving was laid in the traditional way with a solid mortar bed with mortar joints. Our customer’s pool has been totally transformed and will provide years of enjoyment. The above pictures show another local refurbishment project through the various stages. This project also included a new decked area. As you can see, again the pool has been transformed and our customers now have a pool that looks as good as new. If you have missed out on using your swimming pool this summer why not ask us to take a look at the pool and make some recommendations as to what would be needed to bring it back to life. We provide free quotations and work throughout the autumn and winter months on refurbishment projects to ensure the pool is ready for the outdoor pool season. Don’t leave it until spring before planning a refurbishment or you risk not being able to use your pool when the better weather arrives. That would be really frustrating! To arrange a visit, call us on 01536 420400. You’re under no obligation and you’ll know how much it’s going to cost to bring your pool back to its former glory. You may be pleasantly surprised. 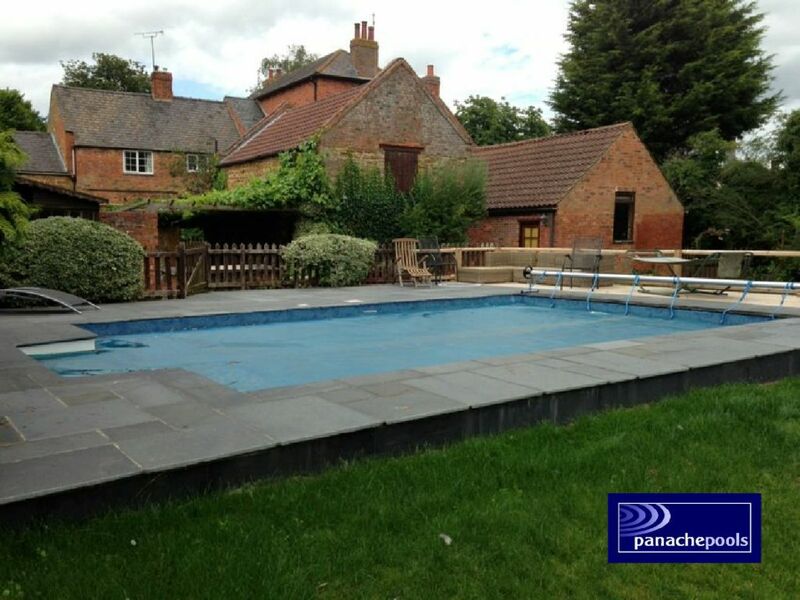 This entry was posted in Swimming Pools and tagged swimming pool refurbishment, swimming pools on 19th August 2013 by panacheleisure. Where will you put your Endless Exercise Pool?